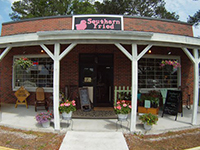 AS Seen in SOUTHERN LIVING, MID-ATLANTIC LIVING: Day Trip: Pungo, Virginia – (May 26-27, 2012). Head south from Virginia Beach for homemade pies, fresh seafood, antique airplanes, and the annual Pungo Strawberry Festival. 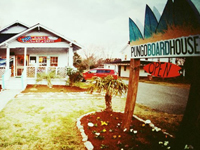 One of seven boroughs that were combined to create the city of Virginia Beach in 1963, the one-stoplight town of Pungo features the best of a farming village and a laid-back beach community. While it’s officially part of the state’s most populated city (and only about 10 miles from the busy Virginia Beach Boardwalk), it seems a world away. You can spend a Pungo day enjoying home-baked goodies, admiring restored World War II aircraft, dining on just-caught seafood, and picking farm-fresh strawberries all within a few miles of the rolling Atlantic waves. Here’s how to do it all. Dylan Rogers also returned to his hometown and opened this shop in 2007. Besides selling beachwear and surfing gear, Dylan repairs skateboards and surfboards and teaches all ages how to ride the waves at Sandbridge Beach about 6 miles from town. “People are surprised to find so many surfers in Virginia,” Dylan says. “But it’s always been a center for Atlantic surfing. That was all my friends and I wanted to do as kids, and I’m glad to see so many local kids doing it today.” 1789 Princess Anne Road; pungoboardhouse.com or 757-426-0111. Four years ago Jerry Yagen was looking for a place to store his private collection ofWorld War I and II-era aircraft. He found a spot at the Virginia Beach Airport just south of Pungo and built the Military Aviation Museum. Now Jerry and a staff of restorers work in the museum’s “Fighter Factory,” keeping more than 50 biplanes, bombers, trainers, and other vintage aircraft shining and soaring. “We try to fly them as much as possible. A plane looks best when it’s in the air,” says Jerry, who pilots many of the airplanes himself. 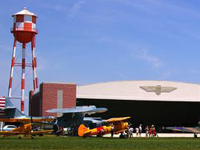 Visitors can see the antiques take off from the museum’s airstrip or during air shows, such as the annual “War birds Over the Beach” event at the museum, May 18-20. When he’s not flying, Jerry stays busy on the ground, adding to his fleet, now one of the largest private collections of flyable wartime aircraft in the world. And he doesn’t just restore American planes. Jerry recently reassembled a 1934 Luftwaffe hangar from Berlin behind the museum to house his growing collection of antique German aircraft. 1341 Princess Anne Road; militaryaviationmuseum.org or 757-721-7767. The name of this place just about sums up its menu. It all began when Margie and Ray Blanton opened a country store and tackle shop on the road to Sandbridge Beach in 1964. Their son, Thomas, built an addition and started serving dinner when he inherited the business 35 years later. 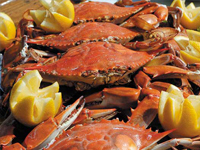 Now beach goers fill the cozy eatery for fried or grilled seafood platters (try the Homemade Crabcake with hush puppies and coleslaw) and some of the state’s best she-crab soup. 1240 Sandbridge Road; margieandrays.com or 757-426-2397. The Virginia Beach area boasts about a dozen you-pick strawberry farms (with several located near Pungo), and the town goes berry crazy during the Memorial Day weekend Pungo Strawberry Festival. This year, thousands of visitors are expected to convene near Pungo’s only stoplight at the intersection of Princess Anne and Indian River roads for two days of free family fun. 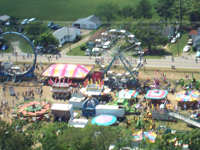 Enjoy browsing works from local artists and crafters, as well as a strawberry pie-eating contest, parade, carnival, live music, pig races, and a livestock show. pungostrawberryfestival.info or 757-721-6001.